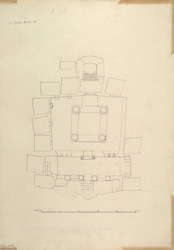 Plan of the Buddhist vihara, Cave XI at Ajanta from James Burgess' 'Original Drawings from the Buddhist Rock Temples at Ajanta.' The Buddhist cave temples of Ajanta were excavated into a horse-shoe shaped cliff overlooking the Waghora River in the 2nd ? 1st century BC and later in the 5th century AD, a period of time which coincides with the Hinayana and Mahayana phases of Buddhist art. Cave XI is an incomplete monastery that dates back to the 5th century. The columned verandah leads to the internal hall which has four columns with pot-like capitals. A Buddha image is carved in front of a stupa. The verandah columns and doorway used to be painted with decorative motifs and the ceiling has paintings of birds and animals. At either side of the verandah doorway are large figures of Bodhisattvas.